This final installment in the Slow Cooker Buffalo Chicken saga just might be my favorite. The Slow Cooker Buffalo Chicken Sliders with Avocado Ranch Dressing were pretty darn great. No one can deny the decadent deliciousness of Buffalo Chicken Quesadillas . 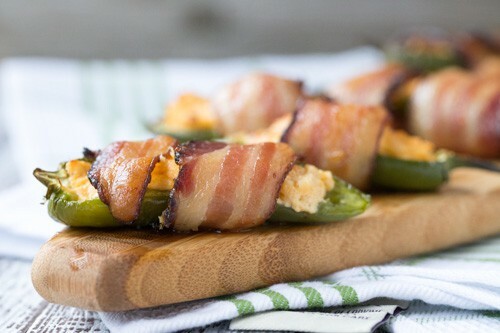 But these Bacon Wrapped Buffalo Chicken Jalapeño Poppers… besides being a mouthful to say, well, they are pretty epic. 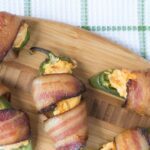 I actually had grand plans to serve these creative jalapeño poppers this past weekend at my church’s annual men’s retreat. Every October, 40 or so of us men take a weekend trip to a retreat center/inn/cabin/hobbit house in Pennsylvania. It’s a great time to spend getting to know some new faces in the church, grow in our faith, and do manly things like poker (not me), smoke cigars (not me), go to a shooting range (not me), and play golf, Settlers of Catan, and eat way too much junk food (me, me, and me). So anyway, I was going to make these for the guys with the leftover Slow Cooker Buffalo Chicken I made for our opening feast Friday Night, but there was literally none left. They ate it all. Every last morsel. Devoured might actually be the more correct word. Moral of the story. Save some of your buffalo chicken to make these, because it’s totally worth it. Oh, and I also made the slow cooker buffalo chicken, a bunch of apple crisp, sweet potato salad with bacon, and a mustard cole slaw. A lot of food, right? I thought so. But these guys are professionals. Eating a ton of food at the men’s retreat is something they train for all year long. So let’s talk about these poppers. Can you imagine a better game day snack for the football fans in your family? 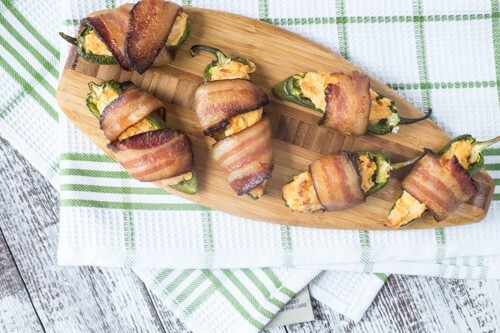 It’s buffalo chicken meets jalapeño poppers and then, like that’s not enough, it’s wrapped in bacon. And really, there aren’t many foods that don’t improve with a little bacon love. -wear plastic gloves while handling the jalapeños if your skin is sensitive to chiles. Mine aren’t anymore so I don’t bother, but I do make absolutely sure to wash my hands immediately following. That’s because one time (okay, twice. No I’m lying, more than that…) I was lazy and didn’t bother. And then I decided to just rub my eye quickly and then. Yea, it was painful. -make sure the bacon isn’t thick cut. It will take too long for the bacon to cook and by the time it does, your jalapeño and filling will be long past it’s delicious prime. In all honesty, the bacon in these photos is thick cut. That’s all I had on hand and for the life of me, had no desire to go all the way down the road (all of 5 minutes) to the grocery store. To make thick cut bacon work, I had to partially bake it on a foil lined baking sheet in a 375°F oven for about 10-15 minutes, allow it to cool to the point I could handle it, and then wrap it around the poppers and cook as directed in the recipe. -Have any of that delicious Avocado Ranch Dressing left? Well now it’s called avocado ranch dipping sauce. Use it for these puppies and you won’t be sorry. Cut jalapeños in half lengthwise and use a spoon to scoop out seeds. If your hands are sensitive to chiles, wear plastic gloves. Wash hands immediately following handling jalapeños. In a small bowl, combine buffalo chicken with cream cheese. Spoon a bit of the mixture into each jalapeño. Cut bacon slices in half, and wrap bacon around each jalapeño. 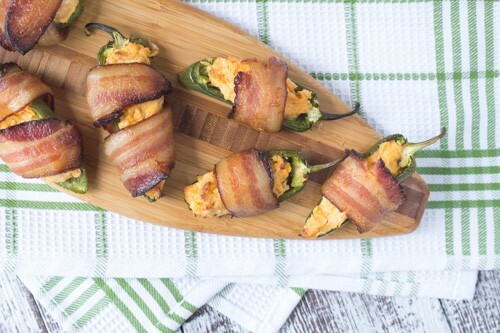 Place stuffed jalapeños on a foil lined baking sheet and cook in a preheated 375°F for approximately 20-25 minutes, until the bacon is crisp and the jalapeño is softened and cooked through. Serve immediately with Avocado Ranch Dressing or other dipping sauce. 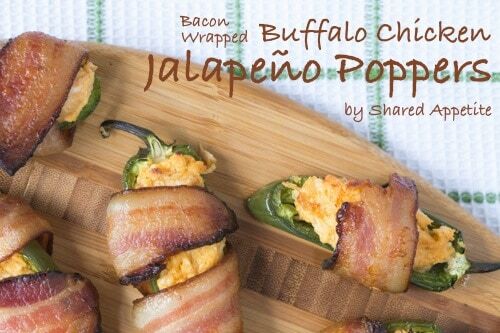 Okay, so you found a way to make jalapeno poppers even More delicious!?! I love the addition of the buffalo chicken. AhhhSome! Thanks so much Nicole! 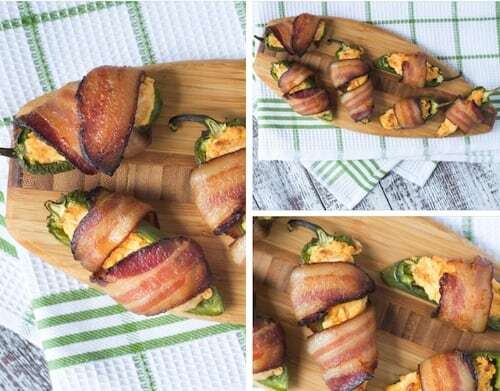 Jalapeno poppers are pretty awesome, aren’t they?